The following is a press release about Schneider Electric most recent LEED Certified project. Greensource uses similar technology for their LEED Certification documentation. Silver certification commemorated during dedication event with company leaders, local dignitaries and business partners and grand opening of Schneider Electric Experience Center. 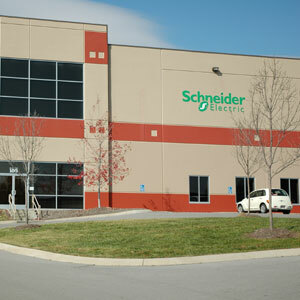 LaVergne, Tenn. – October 15, 2010 – Schneider Electric, a global specialist in energy management, today announced that its LaVergne, Tenn. facility, located at 320 Tech Park Drive, Ste. 100, has obtained silver certification in the U.S. Green Building Council’s (USGBC®) Leadership in Energy and Environmental Design (LEED®) Green Building Rating SystemTM. The facility is the second Schneider Electric building in Tennessee to receive certification, one of few facilities that have obtained LEED certification in Rutherford County and the first in the city of LaVergne. LEED is an internationally recognized green building certification system, providing third-party verification that a building or community was designed and built using strategies aimed at improving performance. The new LEED Silver certified facility is the North America headquarters of Schneider Electric’s lighting and whole-home control business. Schneider Electric used many of the systems it designs and manufacturers within the facility to help achieve the necessary energy and atmosphere points available through the LEED rating system. These systems include occupancy sensors that automatically shut-off lighting when no one is in the area and the schedule-based Powerlink® lighting control system. The company also installed PowerLogic® monitoring systems to establish an energy usage baseline used to monitor and measure performance and help identify future opportunities for efficiency. Schneider Electric’s Andover Continuum® building management system is used to enable the company to review live energy usage and compare information regarding previously used energy. Other Schneider Electric solutions installed in the facility include C-BusTM lighting control network, Juno® lighting products, Integrated Power and Control Solutions (IPaCS)TM equipment and Square D® by Schneider Electric. Today at the LaVergne, Tenn. facility at 10:00 a.m., Schneider Electric will celebrate with a LEED dedication event with employees, company leaders, local dignitaries and business partners. Schneider Electric will highlight the importance of LEED buildings and recognize the impact green business practices have on local employees, the community and the environment. This day also marks the grand opening of the Schneider Electric Experience Center which relocated earlier this year from Orlando, Fla. The Schneider Electric Experience Center is a tangible example of energy efficiency at work and features demonstrations of Schneider Electric’s whole-home and lighting control solutions while serving as an on-site installer training center. LEED® and USGBC® are trademarks owned by the U.S. Green Building Council® and are used with permission. © 2010 Schneider Electric. All Rights Reserved.